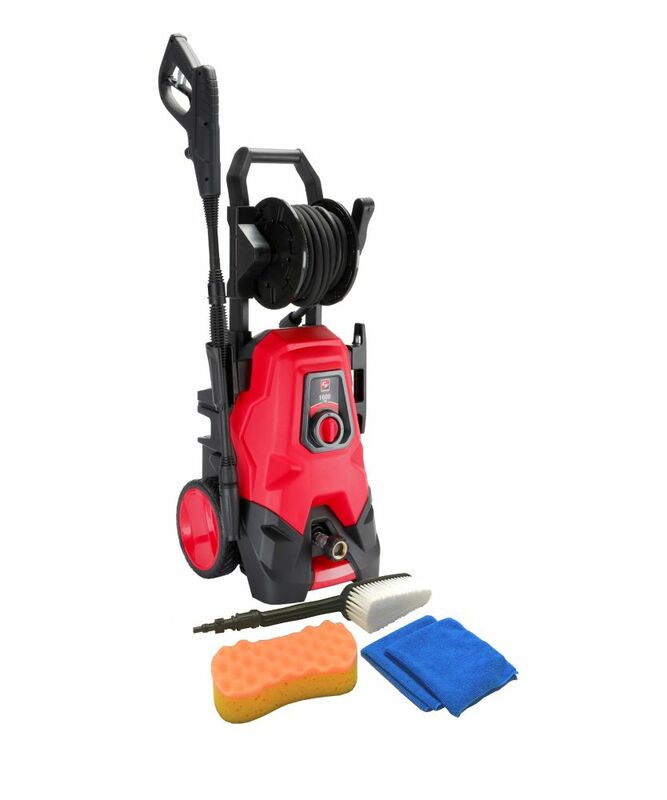 The CF1600C Pressure Washer is ideal for cleaning autos, RVs, decks, patios, outdoor furniture, lawn mowers and a broad of cleaning projects around your home. The pressure washer has an on-board soap tank and spray gun with adjustable spray tip so that virtually all jobs can be completed quickly and thoroughly. 1.35 GPM flow rate combined with 1,600 PSI water pressure delivers 2,160 cleaning units of power! The axial cam pump provides reliable performance season after season. The 20 ft. of non-marring hose stores on the hose reel for quick and easy set-up and clean-up. The car wash accessory kit includes has a wash brush, sponge and microfiber cloths. 1600 PSI 1.35 GPM Electric Pressure Washer The CF1600C Pressure Washer is ideal for cleaning autos, RVs, decks, patios, outdoor furniture, lawn mowers and a broad of cleaning projects around your home. The pressure washer has an on-board soap tank and spray gun with adjustable spray tip so that virtually all jobs can be completed quickly and thoroughly. 1.35 GPM flow rate combined with 1,600 PSI water pressure delivers 2,160 cleaning units of power! The axial cam pump provides reliable performance season after season. The 20 ft. of non-marring hose stores on the hose reel for quick and easy set-up and clean-up. The car wash accessory kit includes has a wash brush, sponge and microfiber cloths. 1600 PSI 1.35 GPM Electric Pressure Washer is rated 2.6 out of 5 by 9. Rated 5 out of 5 by Joe B from Works great no issues I bought this 2 years ago on a clearance sale. It has worked flawlessly for me. I wash my cars, driveway, deck, and house with ease. 1600 PSI is enough power for average home owner. I like the fact that you get a real rubber hose with the unit not a cheap plastic like the rest at double and triple the price. This little unit has been put through the paces and keeps running great. If it ever dies, I will surely buy another one. Rated 1 out of 5 by Emma from No happy I was disappointed in this machine. It can not make press water at all. Rated 1 out of 5 by CottageGal from Connector broke I also had a problem with the zinc connector snapping in two so I cannot connect the hose to the nozzle. It renders the ubit useless. Rated 5 out of 5 by Jeff from Works Unlike everyone else who reviews this I have had no issues. Ive had it 3 summers now and used it almost every weekend for the car, the deck's, the siding or the driveway. I store it in the garage in the summer and the basement in the winter. Even if it died now I have gotten my money out of it. Having read the other reviews I guess maybe I'm lucky? I don't pull it by the hose and that is something I see all my neighbours doing with their various pressure washers. I just finished washing my deck and was thinking about how well it's lasted and figured maybe I should review it. I was a bit surprised when I saw the other reviews. Rated 1 out of 5 by JayD from Piece of Junk Bought this 1 summer ago and used it 4 times. Just brought it up from the basement storage today and imagine. Plugged it in and hooked up the water then turned it on,........ And ,...... It makes noise , but I get no pressure ! Wonderful ! Ya get what ya pay for but I didn't expect this from Home Depot ! $130.00 divided by 4 = $32.50 per car wash ! Rated 1 out of 5 by Doug J from IMPORTANT: READ THIS FIRST I purchased this product and used it for 15 minutes before it failed. The Clear Force pressure washer is very poorly constructed and used an inferior cast zinc for its hose bibs. This bib is prone to snapping off with little pressure and is NOT covered under the warranty. The warranty company, SUMEC, proved to be a big disappointment in that they insist the hose bib is an accessory, although it is an integral part of the pump system, This is typical of the erosion of customer service we are all seeing in recent years. In their rush to maximize profits the manufacturers are using inferior materials and standing by their products. Luckily, I was able to discover this before I made several purchased of large kitchen appliances through Home Depot. I do not recommend this product to anyone. Rated 2 out of 5 by Red Dodge from Larger unit unlisted The 2000 PSI unit is not listed, yet its advertised. Unit CF2000LR. Its adverised in the current flyer and I bought one in Airdrie. so i purchased this product less than a year ago and the port for the spray hose is broke i can't put the nozzle on who can i sent it to or can i bring it back to the store. You can't. The warranty company, SUMEC, claims that the port is only an accessory is therefore not covered. What you have is a $100 piece of junk. You might try filing down the zinc and forcing the hose on, but that's about it. I would like to know if this pressure washer comes with the wand? The picture shows the wand, but does not indicate in the product description, whether the wand comes with it or not.